So far we have been getting to the core of prayer as relationship. Prayer is communication with God and God is a person, and we should call Him by name and speak with Him as a child to a Father. The understanding is that growing in prayer is about personally applying the gospel. It is believing that we are adopted and fully accepted in Jesus Christ, not because of our own worth but in the messiness of our sin we approach God on the basis of the cross receiving grace, mercy and freedom. 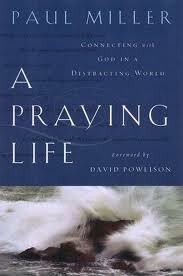 This week I want us to see how a praying life is a result of a sanctified life. In other words, our purpose in life is to glorify God by becoming more like Christ (Romans 8:29-30). This is the Christian’s identity. When Jesus walked in humanity he offered us an example of what it means to cultivate our identity in God. Jesus always lived in relationship and obedience to the Father’s will. His mission was to make known the Father and bring his will into completion. – How many of us can look at our life, or even each day, and say, “God I have glorified you through all my actions today. I have done your will and completed everything you wanted me to do”? Imagine a person who lives a typical, average life. They live life in multiple areas like school, work, family, church, etc. They do normal tasks of shopping, driving, walking, play, etc. Then a regular checkup with a doctor reveals a series of visits being diagnosed with terminal cancer. Their lifestyle and habits decline rapidly. At which point in this person’s were they most helpless? Surprisingly (and perhaps unfortunately), your answer reveals your understanding of spiritual maturity. The reality is that this person had the terminal disease even before the diagnosis. They were just as helpless before the disease was revealed, as after. We are frequently hindered from prayer, obeying God’s will and living the Christian life because we have minimized the power of the gospel. Colossians 2:6 says, “Therefore, as you received Christ Jesus the Lord, so walk in him.” Spiritual growth and pleasing God happens the same way we began our relationship with God. We acknowledge we are helpless in every situation – and prayer and intimacy with God becomes the fruit of our helplessness. The more we confess our need for help and hope in God the more we grow closer to Him and allow His will to be brought about in our life. The citizens of God’s kingdom are broken, weak, sinners who cling to the gospel. God’s kingdom is brought from heaven to earth when we boldly believe the power of the gospel and its promises. – Pray for God’s kingdom agenda to be revealed in your life & family, other’s & commmunity and through our church.